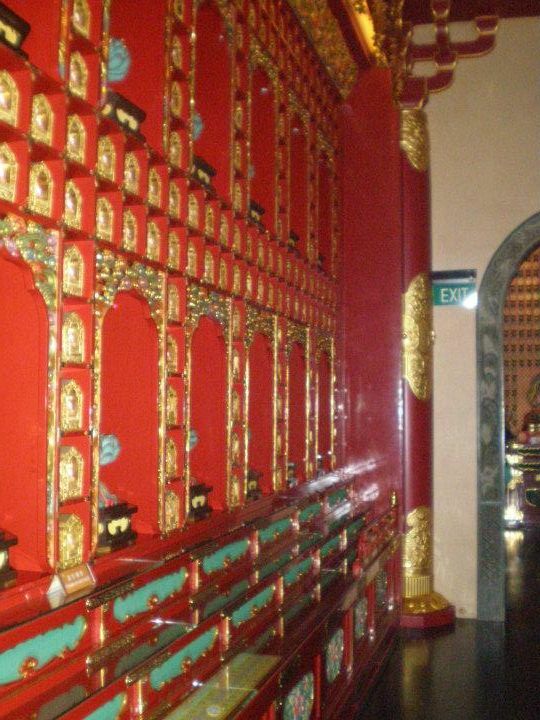 A religious experience in Singapore - Blog from Singapore, Singapore | Where in the world is Celia? When I travel, I always like to immerse myself into the local culture and people, but from the moment I landed in Singpore I felt no difference from being in an American city, like Miami. Tropical weather, tall buildings, nicely maintained highways and cars, buses and trucks everywhere. Everyone speaks Engilsh, so no language barrior to contend. There was no opportunity to practice phrases from a language book and to use a game of charades to communicate with the locals. I was disappointed. Then I thought...maybe I'll go to church on Sunday and see the locals in their natural setting worshipping God in a way they see fit. Certainly, religion would be the best way to see a burst of culture. Here's a little background on the people of Singapore. 75% of the people are of chinese descent, 13% Malay, 9% Indian and 2% everybody else. Although I would say the percentage of blacks is 0.1%. In all my travels around Singapore (and I've covered quite a bit of area) I saw only 2 people of obvious african descent. The most widely practiced religions are Buddhism(33%) and Christianity, followed by Islam Taosim and hinduism. Thus one can easily find Buddhist temples and christian churches around. The first place of worship I attended was Sacred Heart, a catholic church within walking distance of the place I was staying. I decided on the catholic church because I figured catholic churches are one of the few denominations in christianity that appear to be consistent in practice worldwide. My friend told me of a nearby Baptist church but who knows how long that service would last and I had a very busy itinerary and limited time. So a one hour catholic mass would do just fine (turns out the service lasted 1h 15m). Besides, I was told I might finally get to hear some Singlish, a patois that blends English with speech patterns, exclamations and vocabulary of chinese and malay. Sacred Heart is a typical catholic church building, with a small foyer and a a large 12 foot statue of a European Jesus in the center of the foyer. The people touch it's feet and make the sign of the cross before they enter. Inside, the church is a moderate size(seats approximately 600), narrow with a red carpet separating the left pews from the right. I'm surprised by the extensive band consisting of about 6 members (drums, keyboard, ukulele, guitar, tamborine and other instruments). The people who lead the singing stand in the middle of the pew area to the far right with mikes and there are 3 of them. The parishioners fill the church to capacity and sit morose and expressionless. This lack of emotion is typical of the Singaporeans. In fact there was a recent article that labeled them the most emotionless people in the world. I'd agree. People don't smile. They just go about their daily business seemingly unperturbed by anything. I was clearly not from the local area and I got not even a side glance. The city is filled with such beauty, perfection and excitement akin to a disney theme park and no one seems to care or pay attention. I think about New York City and all it has to offer and I notice reactions by even the New Yorkers to events and activities around them. I'm not saying the reaction is always positive. But the point is, there is a reaction. I was pleasantly surprised at the many songs that were sung during the mass - about 6. The music was lively and tropical sounding and I wanted to sway a bit but refrained from doing so and tensed my muscles because no one else was moving. The sign of peace was again another emotionless activity. The people quietly turned to the people closest to them and gave slight nods. Yes I realize handshakes are very western but how can I come to church and not talk to people or even touch them? I wanted to give them a nice Baptist hug and say have a blest week but again i restrained myself. Unfortunately I did not get to hear Singlish because the priest was filipino. I could not tell you what his sermon was about because I could not understand half of what he said through his slurred, drunken words. He looked about 100 years old and it took him about 20 minutes just to get to the pulpit. Ok maybe I exaggerate a bit, but he took a really long time and then he had to stand on a stool to see over the pulpit. When it was time for communion, my suspicion of drunkeness was confirmed when the priest raised the wine cup to his head and gulped down the wine that must have been filled due to the length of time to consume. In my experiences the priest just puts the wine cup to his lips and takes a SIP. I saw this priest's adam's apple hard at work to help the beverage down his throat. I suppose since the parishioners no longer drink wine from a shared cup (apparently they only get the communal wafer when they go up for communion), the priest felt he had to drink the share of the congregation as well. Now for the Buddhist experience. I went to the Buddha Relic Tooth Temple in Chinatown on Monday. What a prodigious structure! There was a labor of reverence and importance to every inch of the building, inside and out. So much reference that I was not allowed to enter the temple in my shorts and was given a long wrap to cover my legs. Certain areas one had to remove one's shoes before walking in that area. The ceilings had such beauty with the carvings and art. The walls were filled with many statutes from top to bottom. People came in, got candles and said prayers and bowed before the statues. I admired them for the reverence they gave their god, something that is lacking in Christianity. I saw so much on that one floor in the temple and was so blown away and told my local friends about it. "So did you see the other 5 floors?" Other 5 floors? Apparently there were more floors even more spectacular than what I had seen. How could that be possible? I will never know because I never returned to the Buddha Tooth Relic Temple.